Although King Midas was almost certainly a real person who existed almost three thousand years ago, it’s unlikely that he ever had the ability to turn anything he touched into gold; of course that hasn’t stopped the stories which have grown around this character over the centuries and so here we have Midas Gold, an online slot from Red Tiger Gaming themed on this chap. 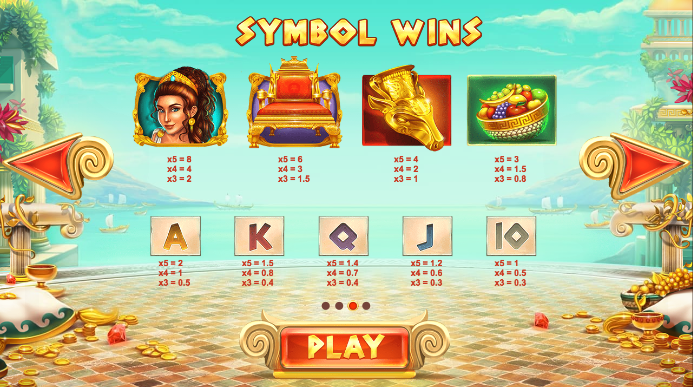 Midas Gold is a five reel slot with three rows and two hundred and forty three ways to win which means that wins are possible as long as there are matching symbols in adjacent rows starting from the left hand side. The design of this game is evocative of Greek myth with pillars, fruit and gleaming gold objects littering the scene. The high value symbols are Midas’ daughter, his throne, a golden animal’s head and a bowl of fruit; 10, J, Q, K and A represent the lower values. There is no wild symbol in Midas Gold, just the Midas symbol which is explained below. This is triggered by landing a King Midas symbol anywhere on the reels and he will now pick one of the other symbols to become gold; all gold symbols will now lock in place for a free respin but if any more matching ones land the process will continue. When there are no more extra gold icons the payout is evaluated. Midas Gold is a good looking slot with a tasty progressive jackpot and a well thought out bonus feature which should prove profitable for the luckier players; it comes with an RTP of 96.22%.